Larry Frazier Beautiful mathematical forms in bronze and alabaster Gump’s held a bronze show in 2011. A dozen or so artists were represented. Two pieces were sold at the opening: a maquette by Frank Gehry, and one of my pieces. Larry’s sculpture and thoughts are the cover article for the September 2008 edition of the internationally acclaimed and peer reviewed Journal of Mathematics and the Arts. One of his pieces was commissioned for the cover of Larson Publishing’s flagship text, their first-year calculus text. Larry’s work is in the permanent collection of the Yale University Art Gallery. One of Larry’s pieces was selected by UC Davis as a gift to present to the wife of Gray Davis, when she came to dedicate the school’s new science and technology building. 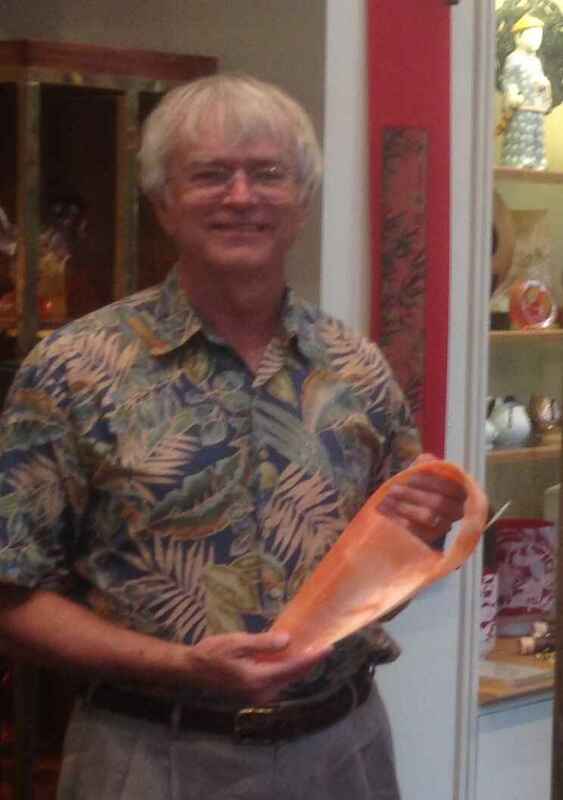 Another of Larry’s pieces was purchased by the State of Hawaii for the Hawaii State Museum of Art. Larry’s sculptures sold well for more than six years at Highlands Gallery in Carmel until it closed with the recession in 2008. They’ve been selling well (about 15 pieces a year) at Gump’s in San Francisco since 2010. Also selling at Dana John Gallery in LA, and at Michael Dawkins Home in New York City and Miami. Larry’s work was selected, but not selected, by the Carmel Art Association. They told me they just love my work, but are too nervous about the parts of their gallery where the person at the front desk can’t see if people might bump one of my pieces. (In twelve years, no gallery has had any such problems.) ! Larry was a “math/science major” in high school, fortunate enough to have excellent math teachers who would show students some of the magic of mobius strips, even though they weren’t in the text books. Besides the top-flight math teachers, the school’s literature teachers were good enough that Larry was motivated to go to a liberal arts college, rather than an engineering school. This small private school required all students to give art a try. Larry was tossed, at random, into the school’s sculptor’s class, and fell in love. Sculpture was his focus that school year, and he went on to complete a Bachelor of Fine Arts at San Francisco Art Institute.